Rhonda Anderson has spent the last eight years feeling hopeless about environmental issues. As the regional organizer for the Sierra Club’s Detroit regional office, the environmental justice leader had little reason to feel otherwise—not under former Republican Governor Rick Snyder whose greatest legacy might be the Flint water crisis that exposed an entire city to tainted drinking water. That’s all changed now with newly-elected Democrat Governor Gretchen Whitmer, who signed a series of executive orders and directives Monday in the name of protecting the environment and stopping climate change. One new executive order will completely restructure the state’s Department of Environmental Quality (MDEQ), a major player in the crisis in Flint that exposed the predominantly black city’s nearly 100,000 residents to lead in their drinking water. Two MDEQ officials have faced criminal charges as part of the state’s ongoing investigation into Flint, and impacted communities have lost trust in the department, Anderson said. Perhaps that’s why the MDEQ has now been rebranded the Department of Environment, Great Lakes, and Energy. This new title comes with a few new offices, including the Office of the Clean Water Public Advocate, the Office of the Environmental Justice Public Advocate, and the Interagency Environmental Justice Response Team. All these offices are dedicated to clean water and environmental justice for low-income families and communities of color, like the residents of Flint. Some of the reporting to come out of the Flint water crisis has raised concerns about another source of contamination: polyfluoroalkyl substances (PFAS) synthetic chemicals linked to cancer and obesity. Gov. Whitmer isn’t overlooking this issue, either. One of her orders aims to strengthen the Michigan PFAS Action Response Team to better locate contamination, protect drinking water, and more effectively inform the public when contamination arises. There’s also climate change. The governor signed a third executive order Monday to create an office of climate and energy that will work on climate mitigation, reducing greenhouse gas emissions, and building a cleaner energy portfolio. Whitmer also moved to formally join the U.S. Climate Alliance, which brings together governors from states to committed to achieving the greenhouse gas reduction targets laid out in the Paris Agreement despite President Trump’s move to withdraw the country from it. Michigan is now the 20th state to hop on board. “The science is in, and it’s time we get to work to mitigate the impact of climate change for the sake of our kids and future generations in Michigan,” Whitmer said in a statement. 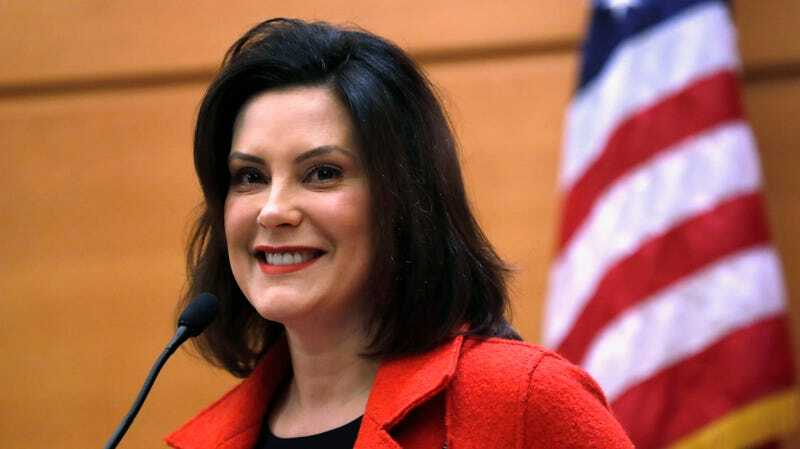 Whitmer is doing all she can with her executive power as governor, but she may yet face political headwinds in a state with a Republican-controlled House and Senate. That’s why Flint Councilman Eric Mays is hesitant to feel too excited yet. “I’m more of a wait-and-see-how-it-goes guy,” he told Earther. He hopes to see the ongoing state criminal investigation of public officials, as well as the civil suits residents in Flint have launched, reach some closure. And he wants to see the people responsible for the crisis held accountable. As for Luster, she’d like to see former Gov. Snyder go down. Just because he’s out of office doesn’t mean he should get to walk away “scot-free,” she said. Especially when he definitely contributed to the mess in Flint.